Mathematical Brain Teasers can be made using different shapes. Earlier Math Brain Teasers published on this website were using different shapes like Triangle. In these Triangle Math Puzzles one has to find the missing number in one of the triangle. Similarly there are Circle Math Puzzles in which one has to find the missing number in one of the circles. Other than Shape Puzzles there are Finding the Odd One Out Mathematical Puzzles. Also there are Math Puzzles in which one has to solve the given Mathematical Equations. Today's Mathematical Puzzles are using the shapes and in these puzzles Square Shape is used. 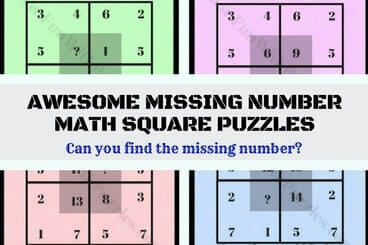 In these math brain teasers there are four squares arranged in 2x2 format. 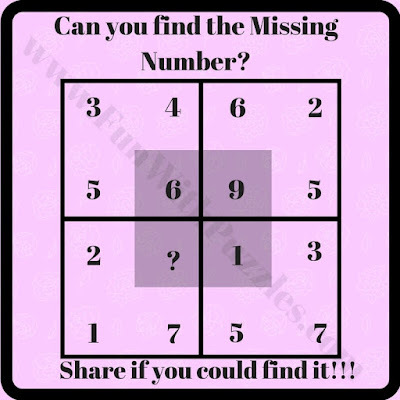 Each square contains the four numbers. Numbers in each square has certain mathematical relationship with reach other. One has to find the math relationship between these number and has to find the missing number. These are the easy puzzles and can be solved easily by teens and adults. However for kids some of these puzzles can be tough. Lets see if you can find this missing number in each of the puzzle quickly? Do post your answers in the comment section of this page. 1. 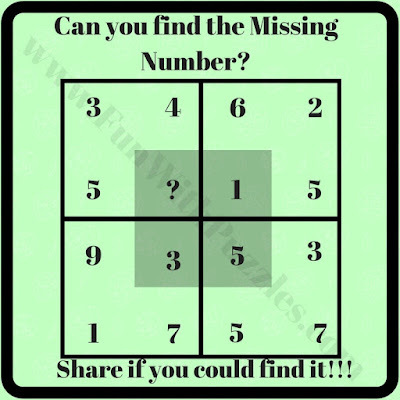 Can you find missing number in square? 2. Can you solve for missing number? 3. What is the value of missing number? 4. Will you find the missing number? 5. Can you solve it for value of missing number? Easy Maths Picture Puzzles with answers for kids: These are easy maths pattern finding picture which in which your challenge is find the missing number. Fun Maths Number Brain Teasers for Kids with Answers and Explanation: One more set of easy number puzzles in which your challenge is find the common pattern of number groups around a square and then solve it for the missing number. Mathematics Picture Puzzles Riddles for Teens with answers: It contains very interesting Maths Equation puzzles in which variables of the equations are replaced with symbols and your challenge is solve the last equation. Tough Math Puzzles Brain Teasers to Tickle your Mind: Most of the puzzle links given earlier contained easy puzzles. However this contains very tough Maths Brain Teasers which will tickle your mind. 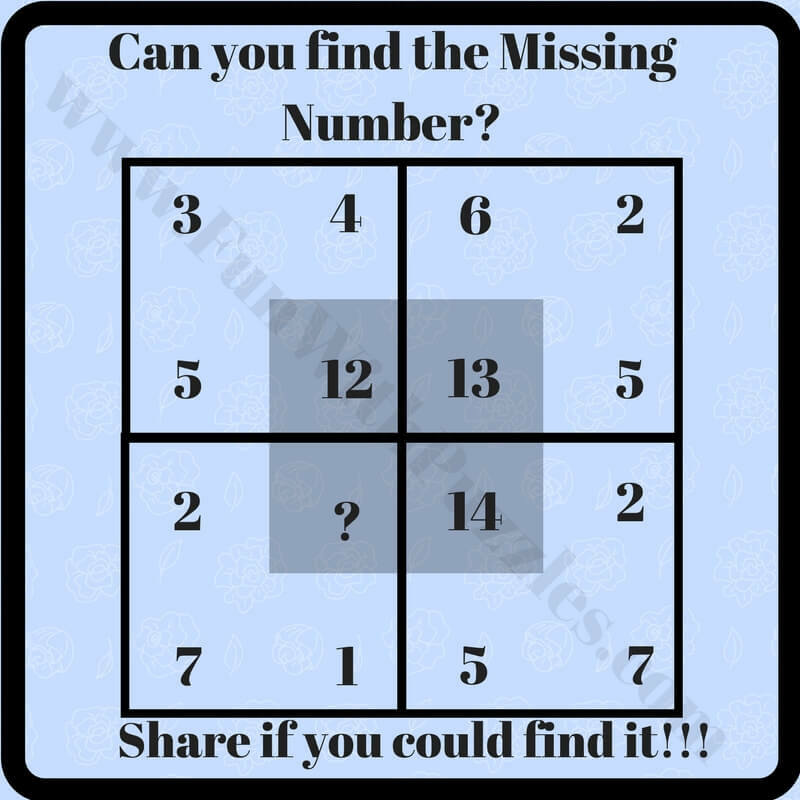 To understand the explanations of these awesome missing number math squares puzzles, lets denote the number in a square with alphabets A, B, C, D starting from top left corner and then going clockwise. Logical pattern linking number in this puzzle is that number near to center is equal to sum of other three numbers. Logical Pattern linking these number is number near the center is equal to multiplication of other two diagonal numbers and then subtract the third number from the number obtained from the multiplication. 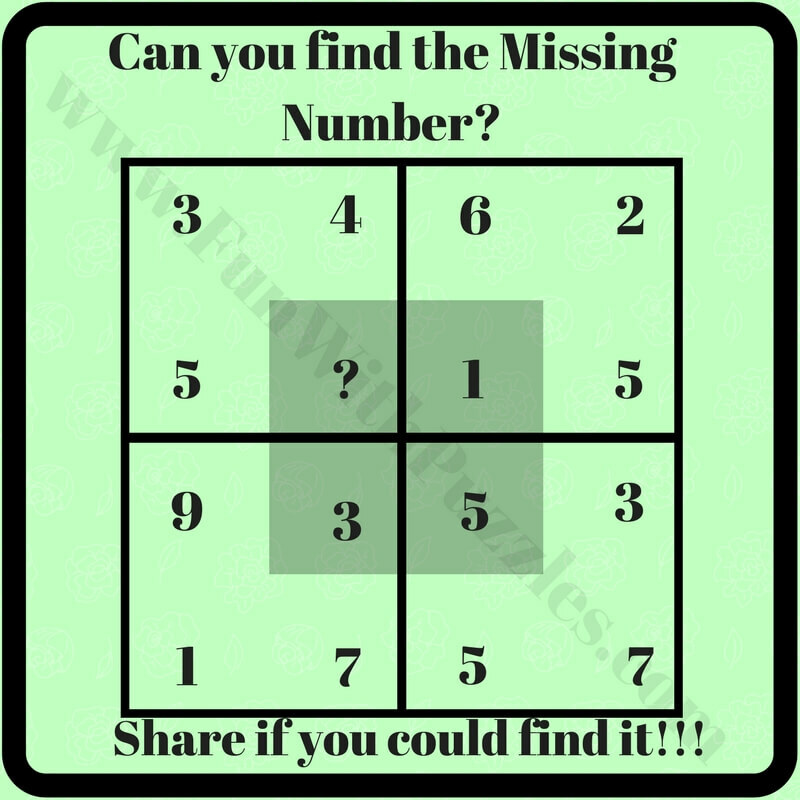 Square number 5 should be 28 (6*5-2 = 28). What am I doing wrong? Help me please. You are right. Answer mentioned in the post was wrong. I have now updated the correct answer. Thanks for pointing out the correct answer for this puzzle.